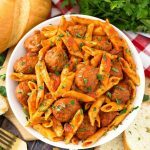 This easy and tasty Instant Pot Meatball Pasta Dinner can be on the table in under an hour! 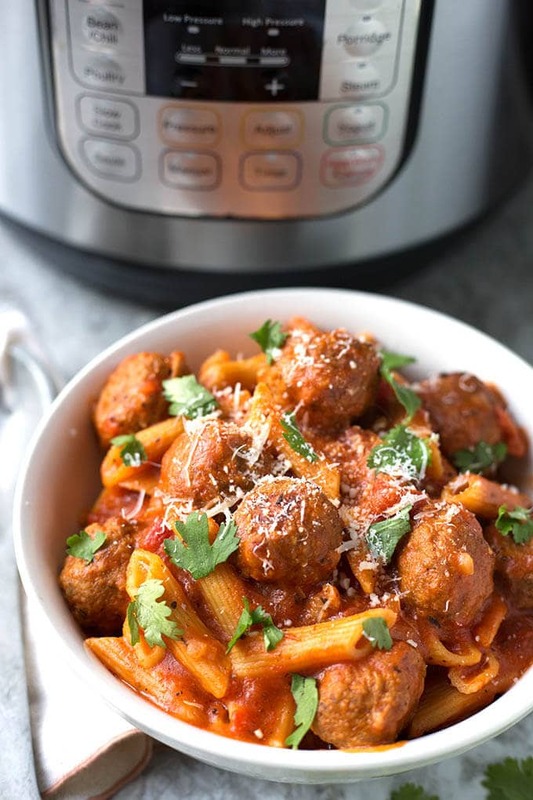 Using frozen, pre-cooked meatballs, and a jarred pasta sauce, you can let the Instant Pot do all of the work for a pressure cooker meatball pasta dinner! I love to cook. I mean, I do have a food blog! But there are those days. You know what I mean. Days that get busy with so many commitments that you finally get home and just have a stare down with your stove. Yep. Been there. Sometimes you get take out, but if you have more than one or two mouths to feed, it can get expensive. Not to mention the time it takes to order and go get it, or have it delivered. 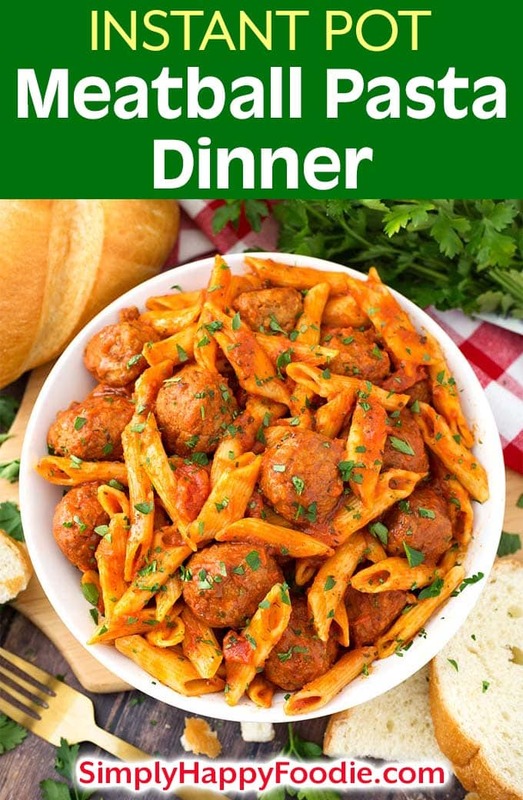 If you have a box of pasta, a jar of sauce, and some frozen meatballs, you can make a tasty and filling dinner for the family that won’t take too long, and won’t break the bank! This recipe makes a lot! Instant Pot Meatball Pasta Dinner is all about layers. You just layer the ingredients in the order I’m going to show you. Don’t stir it. Set the pot and go do something else for about 30 minutes (**It can take about 20 minutes for the pot to come to pressure, but that’s no biggie as it only cooks for about 5 minutes!). When it is done, you Quick Release the pressure, stir it. Eat dinner! Step 1) Put frozen pre-cooked meatballs in the pot. Step 2) Pour in a 1 lb box of pasta. Step 3) Open a can of diced tomatoes and pour it over the pasta. 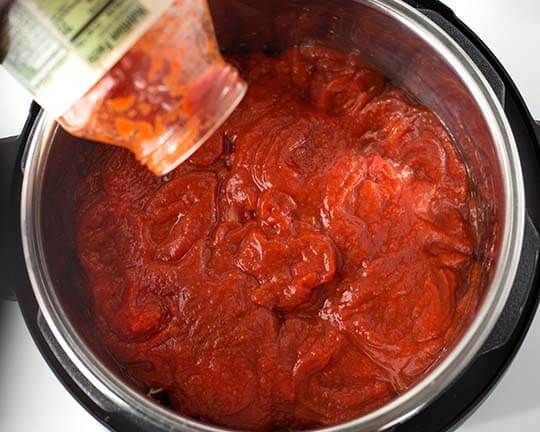 Step 4) Pour a jar of pasta sauce (Marinara is my favorite) on and completely cover the pasta. Step 5) Fill that pasta jar with water or broth 1 and 1/4 times and pour the liquid down the inside of the side of the pot so as not to wash the sauce off of the pasta. 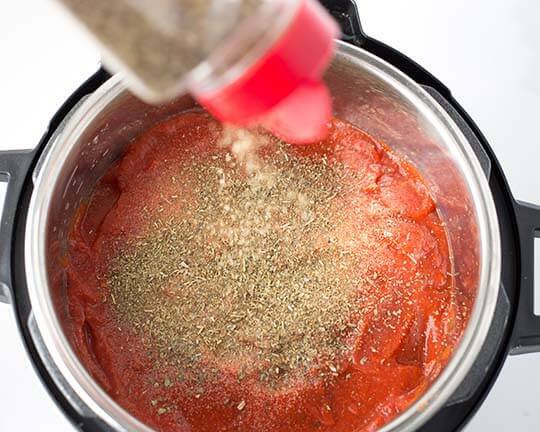 Step 6) Sprinkle on the spices you want. I use Marinara sauce, so I use more. Just close the lid and set the time for 5 minutes, or half of what the package says to do. 5 minutes works perfect on Penne, which is my favorite! 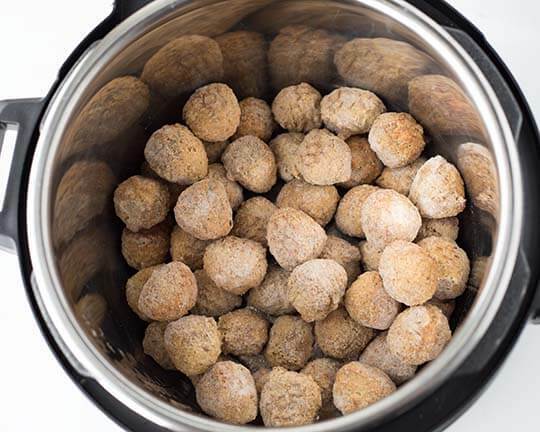 **Due to the frozen meatballs, the pot can take 20 minutes to come to pressure. But it only cooks for a few minutes, so it’s still a fast meal! ** When it’s done, do a Quick Release of the pressure. Stir it. Add cheese if you want. Eat it! EASY and TASTY! Get dinner on the table in under an hour! 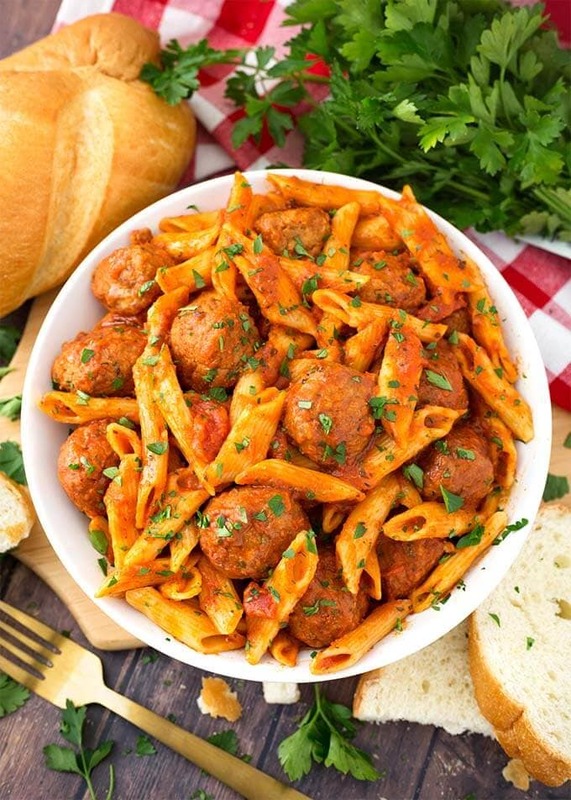 This Instant Pot Meatball Pasta Dinner uses pre-cooked frozen meatballs, jarred sauce, and spices to make it easy and delicious! A semi-homemade meal for a busy day! Layer the Ingredients in the Pot - Do Not Stir! Put the meatballs in the pot. Pour pasta on top and spread out in an even layer. 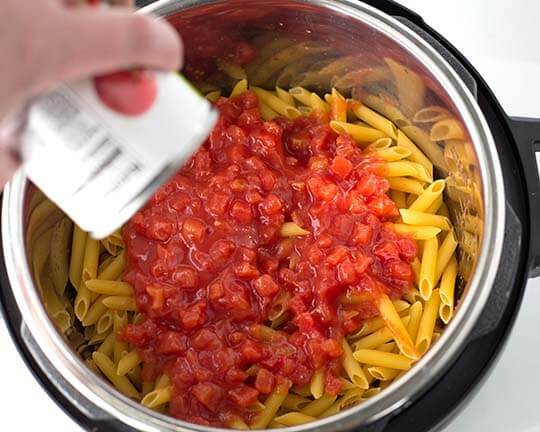 Pour the can of tomatoes over the pasta, evenly. 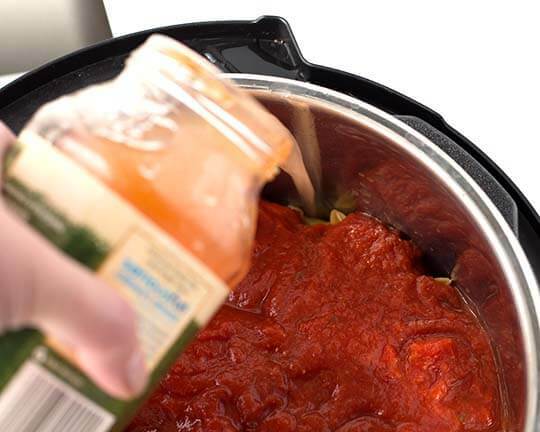 Pour the jar of pasta sauce over, evenly, covering the pasta entirely. Pour the jar with the broth or water along the inside of the pot, making sure you don't pour it over the sauce and expose the pasta. Exposing the pasta may cause it to be undercooked in those areas (Remember to use 1 1/4 jars of liquid, which is 3 3/4 cups). Sprinkle the spices over the contents. Put the lid on the Pot and set the knob to Sealing. Press the Pressure Cook (or Manual) button or dial, and then the + or - button to choose 5 minutes (or half of the cooking time on the pasta package directions). When the cooking cycle has ended, do a Controlled Quick Release* of the pressure until the pin drops. *A controlled quick release means you release the steam in short bursts, then longer bursts, until you can be sure none of the sauce spews out of the vent with the steam from the intense pressure. Then fully open the vent and let it go. Carefully open the lid, facing it away from you. Stir contents and mix in the Parmesan cheese. Taste and add more salt & pepper if needed. Top with the Mozzarella cheese, if using, and cover the pot with a lid (or just use a plate) to help the cheese melt. can I double this recipe in an 8qt IP? Hi Alice, I’ve made this in my 8 qt, and I have doubled the meatballs (takes a long time to come to pressure), but haven’t tried doubling the entire recipe. My advice would be to try 1 1/2 times to see how full your pot gets, and then you will know for the future. Approx. how many servings does this make? About 6 to 8 servings. I am a single Dad always looking for great recipes. 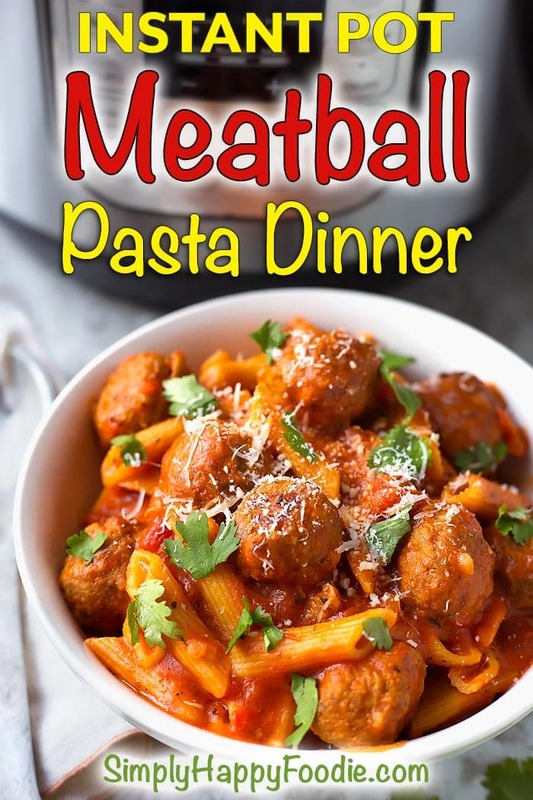 I have been making a lot of pressure cooker pasta dishes and was really skeptical about the dish and meatballs still have any flavor with the 3 cups of water. I was skeptical of everything being cooked with timer set to 5 minutes, This was hands down the easiest and one of the best tasting dishes I made with plenty of left overs. Thank you for putting this up there. David, that is the best thing I have read today! I created this recipe way before I ever started this website. It’s just one of those go-to meals that always works. I’m really glad it worked for you, too, and that you enjoyed it! Thank you for taking the time to review it! I just made this in my new Mini. Thank god I finally made something great I was about to give up hope! Oh no, Teghian, I’m glad you didn’t give up! That recipe has been reliable every time. I do have a few 3 quart recipes on here, and most others you can cut in half. I highly recommend the Zuppa Toscana (cut in half). That one has never failed me either, and it is awesome! Thank you so much for taking the time to review the recipe. Please feel free to ask if you ever have any IP questions! Very easy, worked without issue, extremely good for little effort. Thanks for posting! How much water or broth do you add. It’s a bit confusing. Do you mean 1 1/4 cups? It also says 24 oz which is more than 1 1/4 cup. Can you please clarify? Thanks! Excited to try this recipe. Looks delicious! Hi Lauren, it’s 1 1/4 jars of broth or water. The jarred sauces are usually 24oz in size, so you fill up the jar 1 and 1/4 times. I’m not sure how to make it clearer, but I’ll read over it again and see if I can. I hope his helps. Enjoy! Hi, please excuse my ignorance here but why not put the water in first with the meatballs? IP newbie! I don’t think that would be a problem. I started out making it this way a couple years ago, and I just never did it any other way! It makes sense, and I hope you’ll let me know if it works when you make it! For the IP…should it be high or low pressure? My meatballs were slightly burnt on the bottoms. Would you be able to double the sauce amount? My family LOVES more! Hi Angela, it is supposed to be high pressure. You can absolutely add more sauce. Add extra broth/water, too if adding more sauce. Not sure why your meatballs burned n the bottom. Just make sure the liquid gets down to them. Would you change anything if using fresh raw meatballs? Hi Tina, I wouldn’t change anything, as long as the meatballs are small so they cook in the short amount of time. Otherwise, if you brown them first, even if they aren’t fully cooked, and then use them, that would be good. And better flavor! You have revolutionized my pasta and meatball game. The kitchen gods as my witnesses, I shall never boil water, boil pasta, saute meatballs, heat up meatballs in sauce, and make a huge mess EVER AGAIN! This was fast and got sauce onto every part of the pasta. Thank you SO much! I have made this at least 6 times now and it is glorious! The pasta cooks to perfection! Everyone LOVES it. The only thing I add is 4 oz of goat cheese (chevre) at the end. Once I remove the lid, I pop that in and set the lid back on top for a few minutes – enough time to let the cheese get melty. Then I stir it all in together. Yummo – makes the sauce creamy! I’m going to try doubling it this week for a work potluck. Sure hope that works. Has anyone tried that with success? Would I set it to cook the same amount of time? Hi Angie! Goat Cheese! One of the loves of my life! I’m so happy that you want to share this with your coworkers. You shouldn’t need to increase the time as the pasta cooks in the set amount of time (do your usual time). The only thing that might change is your frozen meatballs will make it take longer to get to pressure (like a bunch of ice cubes in there!). Hope this helps! Thanks so much for your review! Hi! Thanks so much for sharing this recipe! I tried it and everything came out great except the pasta was a little on the chewy side… I’m thinking that I didn’t add enough water. I admit, I DID kind of just fill up the empty jar and throw it in! ? Do you think that’s why it came out that way? Hi Cindy, yes, the chewiness could be from not enough liquid, or the pasta was a bit thicker/heartier than normal, or there was more used than what the recipe called for. I use 1 1/4 jars of water (or broth), and that seems to do the trick. You can also let the pot sit and naturally release pressure for a minute or two before doing the quick release, and that will cook the pasta more. Hope that helps. Thank you for your review! First of all I never comment on recipe posts but HOLY COW! This was magic. I told my boyfriend this is how I was doing doing dinner and he was very skeptical “ALL in the Instant Pot” “Oh man that seems like too much water” “It’ll really be done in 5 minutes?” Anytime I try a new IP recipe I get a little nervous as I’m relatively new to this magical device but every time I am pleasantly surprised. Honestly, I don’t think I could have cooked the penne more perfectly if I had boiled it normally. It was delicious, simple and FAST. Thanks so much for sharing! Wow Lindsay! Thank you for the super review! It means a lot to me to know that a recipe I created makes someone’s meals a little better, or easier! Truth: I sometimes still get nervous when trying or testing a new recipe, too! Take care! How much water would you add if you didn’t add the pasta? The sauce plus the same in water seems like it would be too runny to me without that pasta in there to soak it up. If I were to half the recipe, should I adjust anything about the liquid? Would I also half that, too? Yes, halve the liquid as that is for the pasta. I’m currently expecting baby number 6 and sometimes I just have no energy left to put together a complicated meal at the end of the day. I’ve made this recipe a few times now and am about to make it again. It has been a lifesaver every time. It comes out so well and it’s so easy. Thank you so so much for posting! I understand! It feels so good to make a quick meal that is home cooked, even semi-homemade, and everyone likes it! Congratulations on baby number 6! Thank you for your review! I don’t have diced tomatoes on hand. However, we have crushed tomatoes, tomato sauce, tomato puree, and an extra can of pasta sauce. Which would you use? I’m thinking crushed tomatoes? Thank you! Hi Becky, yes, I’d agree that crushed tomatoes would be good. I would pour the can into a bowl and break them up a little with a fork before adding them to the pot. Don’t drain them! I just made this meal and it is absolutely delicious. 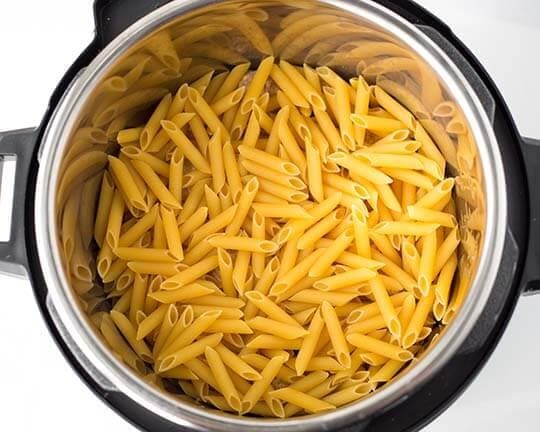 I used whole wheat spaghetti and will make this from now on in my instant pot. I’ve never been a fan of frozen meatballs. On busy days, frozen saves time. This recipe made them taste like homemade. Thank you! That’s awesome, Felicia! Thank you for your review! You could use tomato sauce, or more of the jarred sauce. Or I’m wondering could I zap the chunky tomatoes in my blender to make no real texture to the sauce. Or use a mini chopper. I never leave comments but: This was the first meal my spouse and I made in our brand new Instant Pot and it was a total success. We’ll definitely make again and it was a fantastic way to break in our IP. Awesome, Rebecca! You are off to a great start, and I’m very glad you liked this recipe! Thank you so much for your review! Thank you! So simple, so good! I was busy and missed the beep, so it went 3 minutes after cook time before I released pressure. This made it a bit overcooked, but still delicious. That’s great, Betty! I’m so glad you liked this recipe! Thank you for your review! Just tried this tonight and it was awesome. I was a little skeptical about the amount of Water diluting the sauce, but it was not the case. Thanks, Kathy! I’m happy it worked out for you! Hi Sandy ~ decided to do this marvelous looking recipe for my first ever Instant Pot recipe ~I’m using a 6 quart duo but I see nothing in your recipe about HIGH versus LOW ~ so let me know fior my next attempt! Thanks ? Sorry. My recipes are all High Pressure unless otherwise stated! Thanks Sandy ~ it turned out perfectly ~ I might make this every day 😉 but if I do & balloon up to 400 pounds I’m blaming you ~ bwahahahaha! Hahahaha! I’ll probably beat you to it! Thanks for letting me know how it turned out! Just got this on my birthday and have only made rice and shredded chicken breast. I have lentil bean pasta, so it probably has more fiber sort of? Will it take longer? (we don’t mind having the pasta more softer, as my preschooler likes it. I would try half the time the package directions say. Made this tonight and it was awesome! Super easy as well!! Thank you for this recipe! It will definitely be on our weekly meal plan!!!! That’s great, Melissa! Thank you for your review! Awesome recipe, thank you for sharing! I made this last night using fresh meatballs and it turned out great as you speculated above with Tina, so you can take that info to the bank. My notes: I used the low sauté setting to soften about a cup of onions and a couple cloves of fresh minced garlic in butter for about 5 minutes, then added the meatballs just to brown for another ~5 minutes. At this point, I poured in the water to cover (thanks to Anna), and proceeded with your order of layering. BOOM! This turned out great. I am brand new to the world of IP so have been enjoying finding and testing recipes like yours, so this was a VERY welcome find. I’m still skeptical of the timetables involved (not being able to see inside throws me off my game!) so I kept the pressure timer at 10 minutes just due to my own paranoia. The dish was complete, balanced, piping hot, and easy to execute. What are the ingredient measurements and times if you have the mini? This seems too big for just 1 or 2 people. Thanks. Just cut the recipe in half, and keep the cook time the same. Awesome recipe.and so easy to make everyone was raving with big smiles I just added some RICOTTA cheese to it and it was the BOMB at the dinner table his will be a regular meal at my house Thank you!!! AMAZING!!!!! I am not new to the instant pot but have only put pasta in it when making the mac n cheese recipes, which I have now perfected to only cooking the pasta for 4 minutes. I love my pasta sauce to taste like it has been simmering on the stove all day so I always used to pour a jar sauce in with meatballs and cook for 35 minutes and then quick release. Tonight the hubby was soooooo hungry and not in the best of moods so I decided to try your recipe, and throw it all in the pot for 5 minutes. OMG~~~~~LOVED IT!!!!! So guess what no more separate pots of pasta for us! All I did was meatballs bottom, penne pasta, sauce, then the water around the edges!!!!! It really was that simple and tasted homemade! THANK YOU! Hi LJ, I’m so thrilled that this was such a success for you! I have to say this is one of my family’s favorites! So easy at the end of the day to put everything in the IP, make a salad, maybe garlic bread and dinner is served! I like to add mushrooms and a sliced zucchini or 2 (depending on size) sliced and put on top. When it’s done, I stir in some raw, torn spinach or other green with the parmesan cheese. Sometimes I like to add a bit cream cheese, and I am going to have to try the goat cheese as suggested! Highly recommended!! Thank you for this recipe, I can’t wait to try it. Silly question but how do I know how much 2 lbs of frozen meatballs are? If I buy them, I look for the weight on the bag. 16 oz is 1 pound, so I look for about 32 oz. If I’m using homemade, I actually weigh them on my kitchen scale. In my 6 qt pot 2 lbs is about 1/4 to 1/3 of the pot, depending on how large the meatballs are. The best pasta dish I’ve ever made in the IP. We have a family of 7 so I added an extra pound of meatballs, and an extra 14oz jar of diced tomatoes. It was filled to the full line in my 8 quart IP. Thanks so much for this recipe. That’s great, Christy! I’m glad this recipe worked for your family. Thank you for your review! Where. In the layer would you suggest adding ricotta cheese? I would add it on top of the sauce, or just stir it in after pressure cooking. If I make this in a Mini, should I half the recipe?? Thanks! Yes, and keep the cook time the same.